It’s only six months since we reported on Boatrocker’s plans to open a barrel room and bar across the road from its Braeside brewery. Normally, we wouldn’t revisit such a tale so soon. Yet, while there’s an argument that such a plan – a 15-tap bar pouring some of the most envelope pushing beers in Australia surrounded by hundreds of beer-filled barrels in an industrial suburb with a population of zero – could turn out to be one of Australian craft beer’s great follies, we suspect otherwise. Indeed, were we betting types at The Crafty Pint, we’d wager it will evolve into an iconic Australian beer venue, the sort of place any beer tourist – local or international – will add to their bucket list and find a way to visit, whatever it takes. Why? Because if the past few years since Boatrocker was launched by Matt and Andrea Houghton have shown anything, it’s that they do things right. Not only is Matt one of the sharper, most forward thinking and opinionated people in the industry, but he's not afraid to take his time. As a brewery, they've shown they're willing to do things the hard way, and the results, whether it’s the Ramjet imperial stout, Mitte Berliner Weisse, Banshee barley wine or any number of other beers, keep proving the wisdom of such an approach – one that saw Boatrocker named Champion Small Australian Brewery at this year’s Australian International Beer Awards. The Barrel Room will become home to those beers plus many more esoteric releases – high ABV whisky and bourbon barrel-aged brews and all manner of sours – as well as the core range. And it’s the last of these – particularly the Suburban Pale (née SMASH), recently returned Hoppbier pilsner, and Alpha Queen – that the recently rebranded Boatrocker hope will ensure the venue attracts an audience broader than the beer geeks already drooling in anticipation. At the same time, limited releases will all be launched at the Barrel Room and some tiny batch beers may only ever appear there. “We’ll release beers as widely as possible but want people to be able to come here and try something new and different,” says Matt, who is aiming for a new beer at the bar every month. “Attracting people from Melbourne’s northern suburbs and further afield will be the fact that there’s nothing quite like it in Australia. Yet. 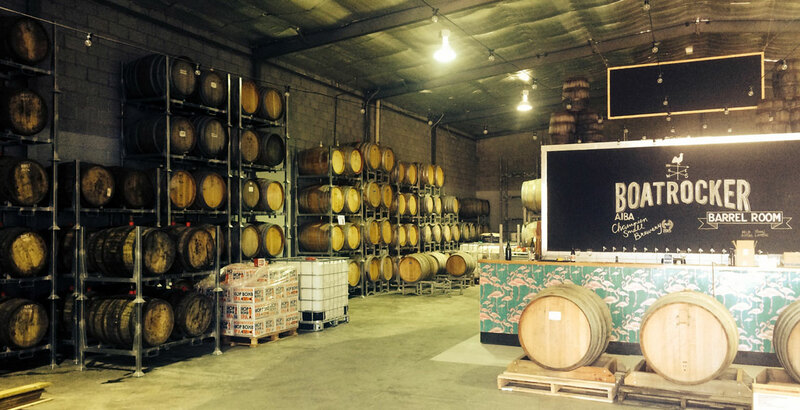 While April’s investment from the former Little Creatures guys at Made by HAND – Howard Cearns, Adrian Fini, Nic Trimboli, David Martin – accelerated the arrival of the Barrel Room, and indeed expansion of the brewery, it remains a pretty handmade affair. Joining the racks of barrels lining the walls of the shed and the central cool room, there’s a bar top made from reclaimed timber, tables made from old cable wheels and a pair of huge, wooden barn doors they’ve built themselves. But it’s the wood housing the beer that will have most people licking their lips in anticipation. 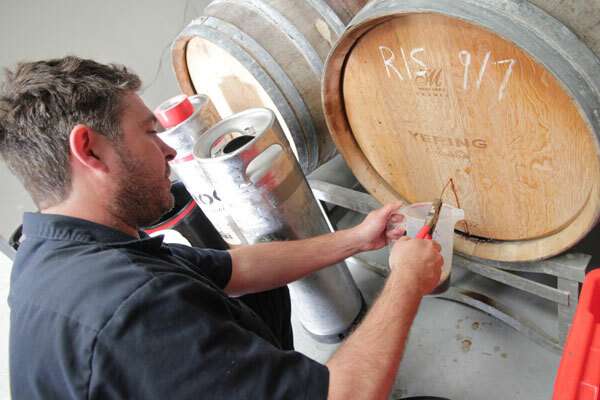 “We’re at about 150 barrels at the moment with more on the way,” says Matt. The first 60 were purchased from Yering Station before Boatrocker transitioned from gypsy brewer to stainless steel owner in 2013. Since then, they’ve added oak from Melbourne whisky brand Starward, American bourbon producers Heaven Hill and Barton Distillery, plus winemakers on the Mornington Peninsula. The most recent arrivals are five puncheons from the Adelaide Hills – twice the size of most wine barrels – which will be used for the ongoing “brambic” program, brambic being Matt’s term for his lambic style ales; short for Braeside lambic. The first brambic, which was the very first beer he put through his brewery in early 2013, will be available for the first time at the Barrel Room launch tomorrow. You can read what we made of it on the site tomorrow, but let’s just say the full-bodied, low ABV, uncarbonated drop doesn’t shirk when it comes to sourness or funk. The aim is to build stock of such beer over time to allow for blending of different vintages as well as ageing with fruit: raspberries and apricots are mentioned in conversation. Also on the horizon are two new Berliner Weisse: the returning Miss Pinky and a new one made with peaches, plus a fresh run of the Orange Sherbet originally brewed with Denmark’s To Øl. Completing the picture at the Barrel Room is the food. They’ll be serving up charcuterie in house and also inviting food trucks along. As for the new look Boatrocker logo, which follows the launch of a second brand of sorts, Big Love, and features a weathervane with a rooster wearing a hat, Matt said it was always planned. Aside from the redesign, Howard and the rest of the Made by HAND foursome remain an influence mainly in terms of mentoring Matt and his team on the business side of running a brewery, something they know well not just from Little World Beverages but subsequent ventures such as the Hippocampus spirits company and new hospitality ventures in WA. 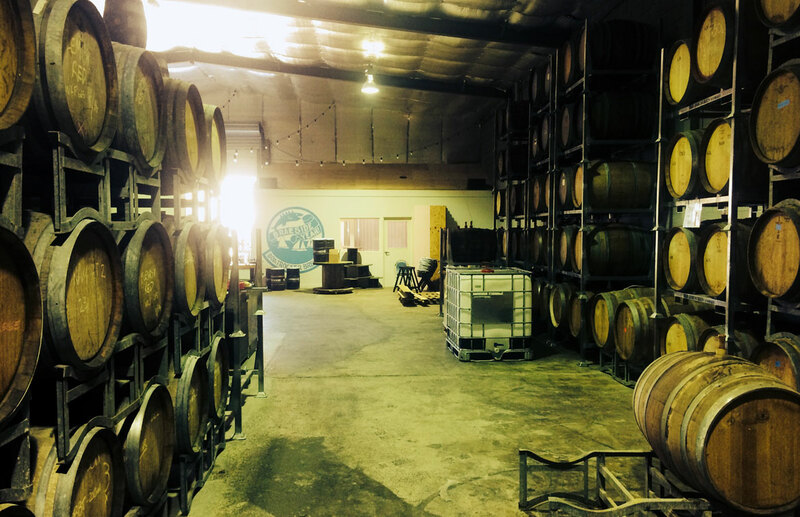 And while focus right now is on the opening of the Barrel Room, such things will come in handy if Boatrocker is going to succeed in the long term, which will mean selling plenty of the core range. 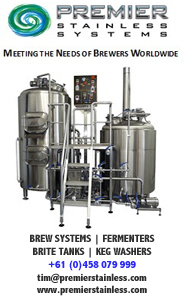 As such, new 40 hectolitre fermenters are in place, which are filled over the course of 14 hour, triple brew days. If you'd like to help him do so, the Boatrocker Barrel Room opens at 4pm tomorrow (October 30) and from 12pm to 6pm on Saturday. It will then be open on subsequent Fridays, Saturdays and Sundays.